The house was recently constructed and has arc-fault (AFCI) circuit breakers installed on most circuits, which is now required by code. Arc fault breakers are designed to detect arcing conditions in the electrical circuits of a house which could cause a fire. The problem is many devices cause nuisance (false) tripping, such as pinball machines and brush type motors used in vacuum cleaners and drills. These devices have naturally occurring sparks being generated internally. Therefore the arc fault breakers are supposed to be able to tell the difference between a safe arc and an unsafe arc, but sometimes they don’t do a very good job. In the case of an electrical motor, the arcs occur at regular intervals and the AFCI can be designed to ignore these. However, the arcs caused in an electro-mechanical pinball machine are totally random, based on flipper usage and what the ball is doing at any given moment. I’m sure the designers of arc-fault circuit interrupters didn’t design them with an old pinball machine in mind. 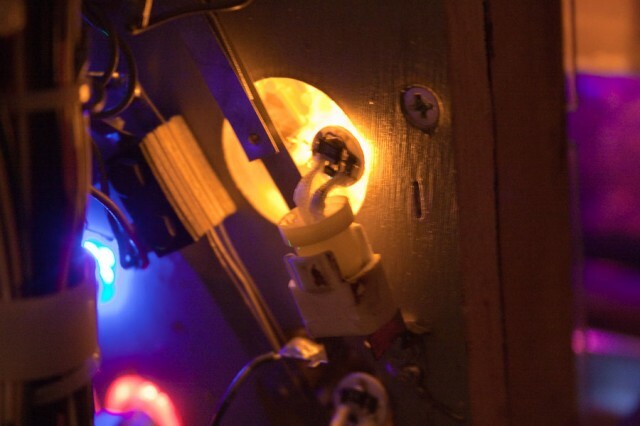 An electromechanical pinball machine has over a hundred switch contacts and many dozens of coils, which combine to create arcs at the switch contacts. These arcs are expected. 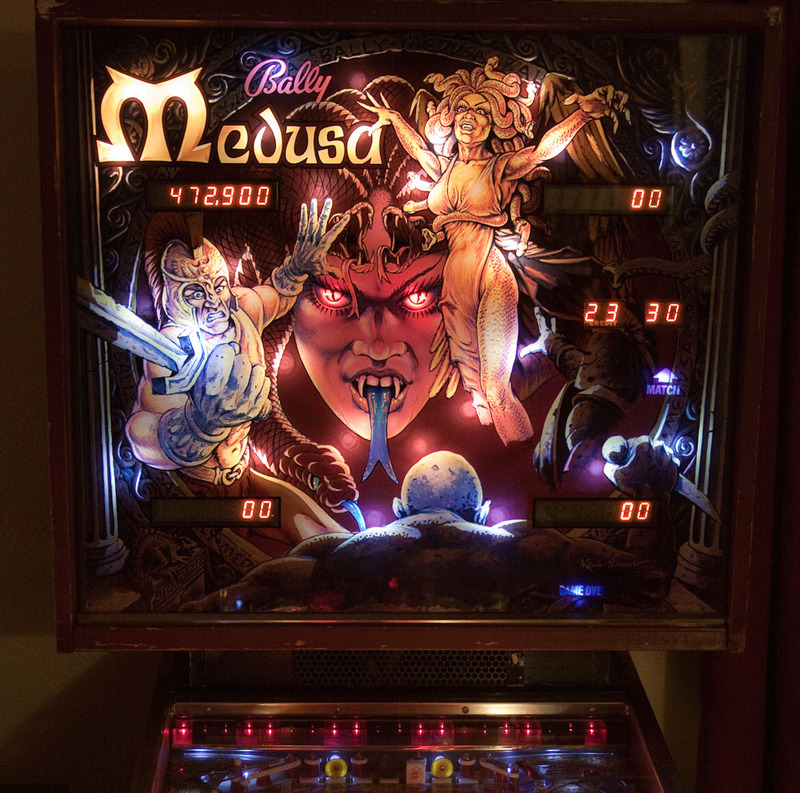 I carefully checked this pinball machine for any unsafe condition such as a bad line cord, ungrounded line cord, bad connections, etc., and could find nothing. Besides, having the pinball machine turned on and left on, without playing, didn’t trip the breaker. If tripped without playing, it would have indicated an unsafe condition. The breaker only tripped when playing, which is when the arcs in the switch contacts are being generated. Using some specialized equipment, I measured very short current spikes of over 15 amps on the line cord when all 4 flippers engaged simultaneously along with a pop bumper or target bank reset coil. The average current was usually 1-3 amps. These 15 amp spikes are so short, they don’t even affect a fast-blow fuse rated at 8 amps. These spikes ranged from a half-millisecond to 20-30 milliseconds. An older style circuit breaker would cheerfully ignore these types of pulses (just like the fuse does). I concluded that pinball machines, especially EM pinball machines, are not compatible with AFCI breakers, or at least the brand of AFCI that was installed in the house. Replace the ACFI breaker with a standard (old?) style breaker on the circuit that supplies the pinball machine. This would make the house no longer pass an inspection, but one could reinstall the AFCI when the house is sold. The difference in safety is negligible due to the astronomical odds of a fire being started by an arc in the first place. Replace the ACFI breaker with one from a different brand. This is not as easy as it sounds since certain brands can only work in a certain panels. But, some brands are apparently less prone to nuisance tripping. 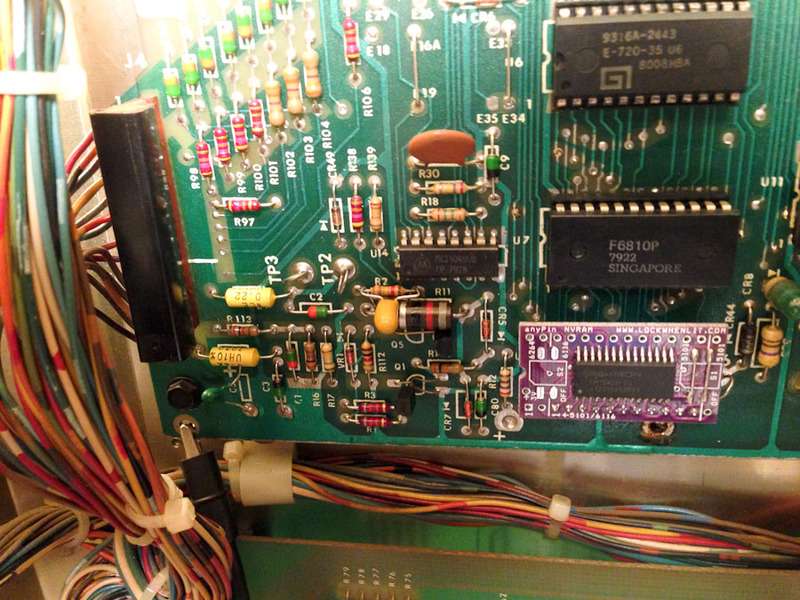 Try to filter the pinball power so that the arcs and current spikes are not as noticeable to the breaker. In the case of this repair job, I installed a 2 ohm, 50 watt resistor in series with the line, downstream from the fuse, to help limit the current spikes. 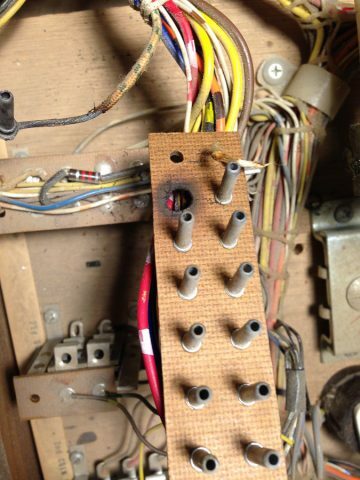 This causes a voltage drop in the machine when the current spikes occur. (There is nothing special about the resistance value. It was just something I had on hand. A 100 watt resistor would be preferable as the 50 watt resistor will get warm after a while (but not too hot to touch). This machine had been previously converted LEDs, so this approach wouldn’t work with regular bulbs installed.) The jury is still out on this approach, but it seems to be working. Consult with a licensed electrician for the first two options. I’m not one. I think if it were any other pinball machine, one that had only 2 flippers for example, it probably wouldn’t have been a problem. And now that I think about it, an EM machine with incandescent bulbs instead of LEDs, might bury the inductive spikes in the resistive current draw of the machine. As more new houses are being built in Colorado and utilizing AFCI breakers, and as more old pinball machines end up in these houses, it will be interesting to see how much of a problem this will be in the future. Symptoms: Not all sounds are being played. The owner had already replaced the troublesome capacitors, but the Cheap Squeak sound board was not producing all of the sounds. I bench tested the sound board and everything seemed to be fine. Open the coin door and press the small test pushbutton switch near the top center of the door. This will begin the various steps of the self test. The first test is the display test and all of the displays will start counting up. Continue pressing and releasing the test switch, no faster than once per second, until you see the Ball Count display (right side middle of the back box) incrementing 1, 2, 3, with every press of the switch. You will have to step through the other self-tests before the value will start incrementing. Continue pressing and releasing the test switch until it has counted up and the display is showing “18”. The other score displays will probably be displaying “00”. Press the replay/start button on the front of the coin door until the other displays are showing “03”. They will increment starting at 00 with each press of the start button. Turn the power off, and wait about 5 seconds and power the machine back up. Play a game and the sounds should all be working. When a game is started, the background music will start. 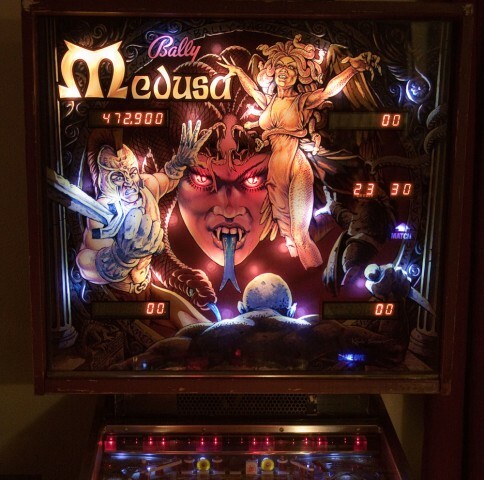 On this particular pinball machine, pressing the replay/start button in Step 4 did not advance the value shown in the score displays. This was because the switch was grounding out against the metal support behind the switch. There is normally a thin, stiff, piece of cardboard (called “fish paper”) to insulate the switch, but it was missing. The metal support was taped to insulate it, and the switch began to work properly. Symptoms: Blows playfield coil fuses; needs new rubbers and bulbs, cleaning. I started by replacing both playfield fuses since they were blown. When I started a game, the kicker at the outhole started firing randomly, sometimes very rapidly. The sensing switch seemed to be fine. I also noticed that some of the pop bumpers weren’t firing correctly. If I pressed on the left pop bumper skirt, the center pop bumper would fire. Basically there was something not right with the solenoid driver circuit. I started with the signal for the kicker coil, and with the oscilloscope, I traced it back through the solenoid driver board. The signal going into driver transistor Q11 was going crazy. I went further back to the output of the 74154 decoder chip (U2) and the signal (pin 15) was still crazy and random looking. No wonder the fuses blew. I checked the input signals to the 74154 and the “B” signal was randomly moving between 1 and 2 volts. This is neither a digital “1” or “0” and it makes digital circuits act randomly. 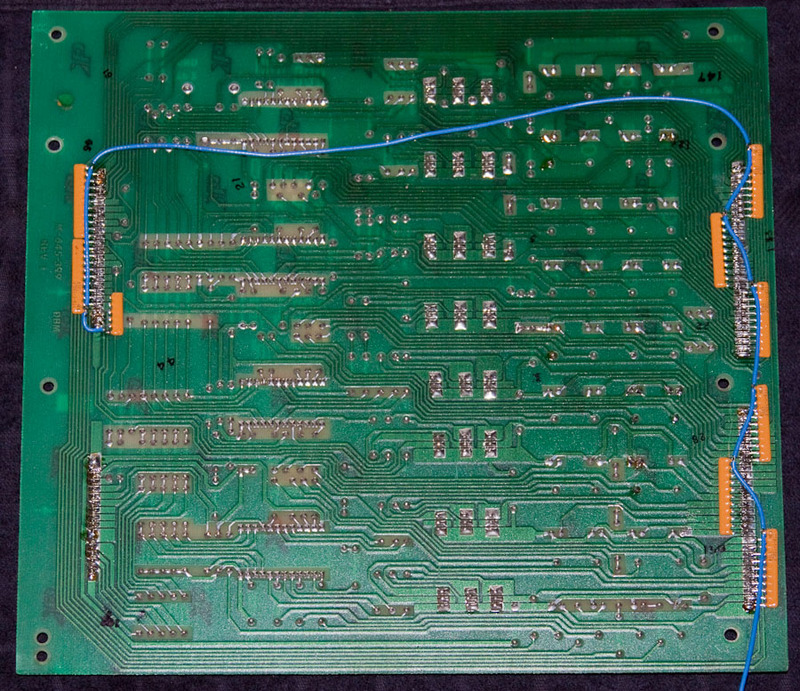 I traced the signal further back to the MPU board to the output of the 6820 PIA (U11, Pin 11). Since the 6820 was already in a socket, I lifted it out of the socket and bent pin 11 out, then put the 6820 back in. This isolated pin 11 from the rest of the circuit to make sure that nothing else was interfering with the signal. The oscilloscope showed it was still bad. 6820 PIA chip with pin 11 lifted to isolate it from the rest of the circuit. The faulty “B” signal would also cause the wrong pop bumpers (and other solenoids) to fire. 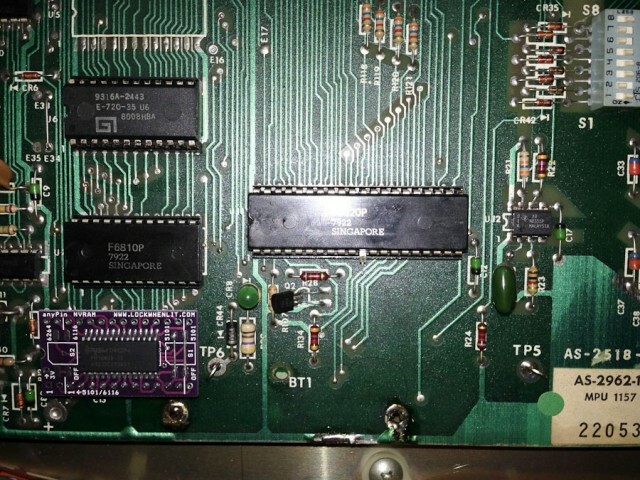 I replaced the 6820 with a 6821 (they are interchangeable) Also, I replaced the 5101 RAM chip on the MPU board with an AnyPin NVRAM module and removed the battery from the circuit board. This will save the MPU board from future corrosion caused by battery gasses. At this point the machine was working well, except it wouldn’t boot about 50% of the time. It looked like a problem with the reset circuit. Bally didn’t include a time delay in the reset circuit like most other manufacturers. I added a 4.7 uF tantalum capacitor across R2 to give the reset a little bit of time delay when it boots. It solved the problem and booted 100% of the time after that. 4.7uF capacitor added across R2 to assist reset circuit. The positive pin of the capacitor is connected to the right side of R2. AnyPin NVRAM module in lower right. Finally, all of the rubbers were replaced, bad bulbs replaced, and the playfield cleaned and waxed. Some of the light sockets needed cleaning because the bulbs weren’t making good connections. Symptom: Cheap Squeak sound board blowing fuses. 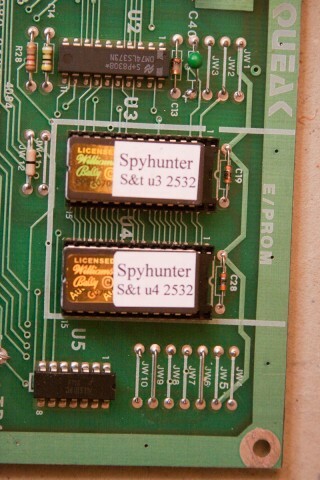 I had another person send me their Cheap Squeak board from their Spy Hunter pinball machine after it was blowing fuses. Compared to last time, it was much easier to identify where the short was located. Both C10 and C22 capacitors were shorted. Tantalum capacitors were used for both C10 and C22, and a variety of other locations on the sound board. Although tantalum capacitors don’t age like aluminum electrolytic capacitors, they have a weakness: they don’t tolerate voltage spikes very well (nor reverse polarity, where they will likely explode). Both C10 and C22 are located on the unregulated 12 Volt supply. This supply normally runs a little higher, and since it’s unregulated can have voltage spikes on it. 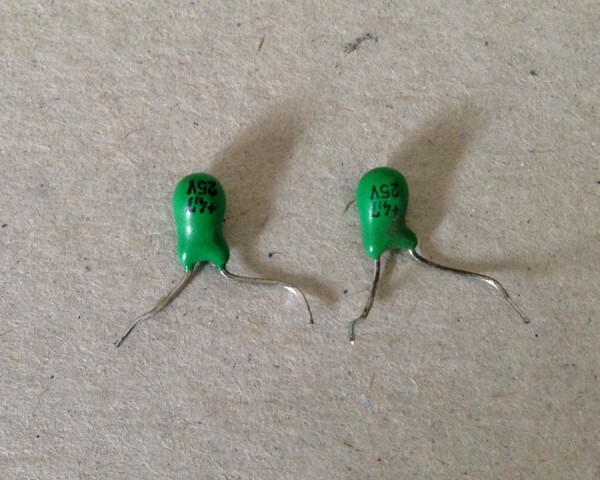 So if your Cheap Squeak is blowing fuses, replace both of these capacitors. The original caps were rated at 25 volts, but I use either a 35 volt or a 50 volt for a replacement to make them more resistant to voltage spikes. The value is 4.7uF. The other tantalum capacitors on the board should be fine since they are downstream from the 5 volt regulator and it’s very unlikely a voltage spike would get that far. They should last forever. Also note that aluminum electrolytic capacitors have the minus “-” side identified on them and tantalum capacitors have the positive or “+” identified on them. The circuit board has only “+” polarity identified for all capacitors regardless of type. 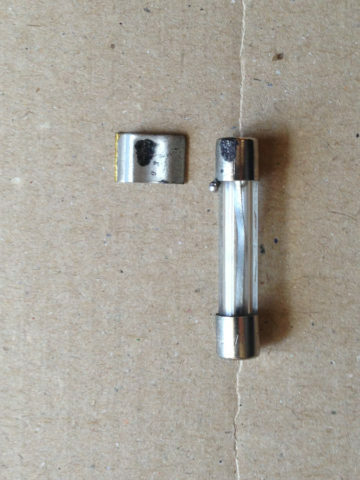 So double check the polarity of the capacitors before soldering them. The owner had done some previous work on the sound board because it was blowing fuses. 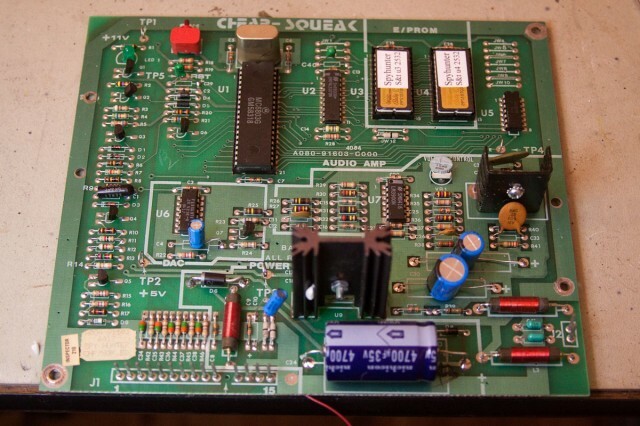 When replacing capacitors, diodes, and ROMs, always double check the polarity. Backwards ROMs. The notch in end edge of the ROM chip should align with the notch in the socket and silkscreen image on the board. I determined that the 6803 controller was bad, as well as one of the ROMs. Symptoms: Wouldn’t boot, rubber rings crumbling. This machine sat neglected prior to the current owner purchasing it. Although the NiCad battery looked ok and looked like it had been replaced relatively recently, there was a lot of corrosion on the CPU board. It was even affecting the RAM sockets, where I could see blue-green corrosion in the socket holes. During the boot process, the LED would only flash a couple of times, indicating a RAM failure. Normally I would try to fix something like this. In this case, since there was an aftermarket CPU board available, I recommended the owner purchase the new board. 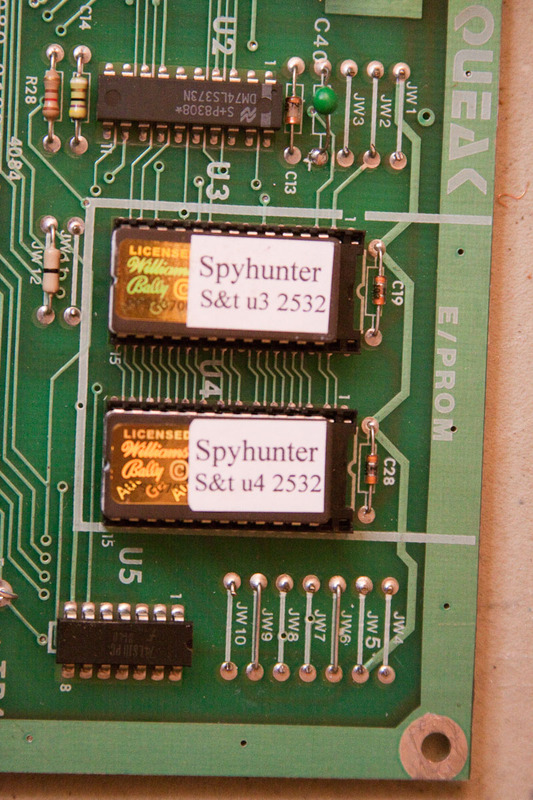 With the old board, I could fix one thing, only to learn something else was damaged by the corrosion. It turned out I was correct, except the corrosion had spread to the sound board, which sits right below the battery. It had damaged the sockets there as well. I was able to get the sound board working with some cleaning. 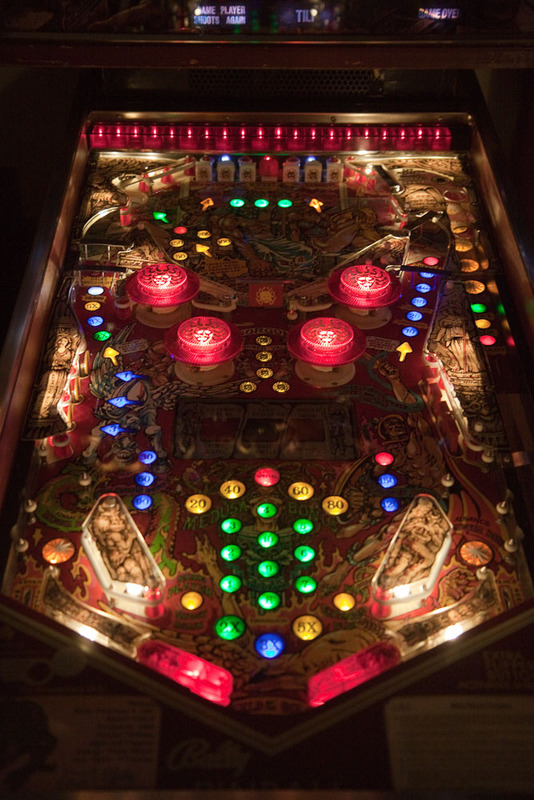 The rubber rings and burned out bulbs were replaced, and the playfield cleaned as well.